Active parking management is the dynamic management of parking facilities in a region to optimize performance and utilization of those facilities while influencing travel behavior at various stages along the trip making process: i.e., from origin to destination. Dynamically managing parking can affect travel demand by influencing trip timing choices, mode choice, as well as parking facility choice at the end of the trip. This ATDM approach can also have a positive impact on localized traffic flow by providing real-time parking information to users and ensuring the availability of spaces to reduce circling around parking facilities. The overall goal is to help maximize the nation's transportation infrastructure investments, reduce congestion, and improve safety. Dynamic Overflow Transit Parking: This strategy dynamically utilizes overflow parking facilities in the vicinity of transit stations and/or park-and-ride facilities when the existing parking facilities are at or near capacity. The overflow parking are typically underutilized, such as large retail parking lots, and transit agencies could have agreements with these entities for occasional use of pre-designated, underutilized areas of the parking lots. In an ATDM approach, the parking demand and availability is continuously monitored and real-time determinations are made if overflow parking is needed, and accompanying dynamic routing information would be provided to travelers. Dynamic Parking Reservation: This strategy provides travelers the ability to utilize technology to reserve a parking space at a destination facility on demand to ensure availability. In an ATDM approach, the parking availability is continuously monitored and system users can reserve the parking space ahead of arriving at the parking location. 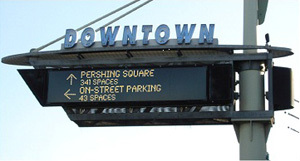 Dynamic Wayfinding: This is the practice of providing real-time parking-related information to travelers associated with space availability and location so as to optimize the use of parking facilities and minimize the time spent searching for available parking. In an ATDM approach, the parking availability is continuously monitored and routing information to the parking space is provided to the user. 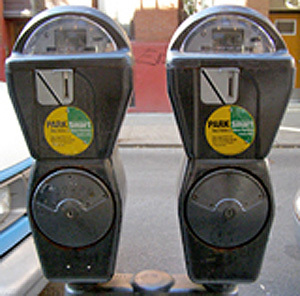 Dynamically Priced Parking: This strategy involves parking fees that are dynamically varied based on demand and availability to influence trip timing choice and parking facility or location choice in an effort to more efficiently balance parking supply and demand, reduce the negative impacts of travelers searching for parking, or to reduce traffic impacts associated with peak period trip making. In an ATDM approach, the parking availability is continuously monitored and parking pricing is used as a means to influence travel and parking choices and dynamically manage the traffic demand.